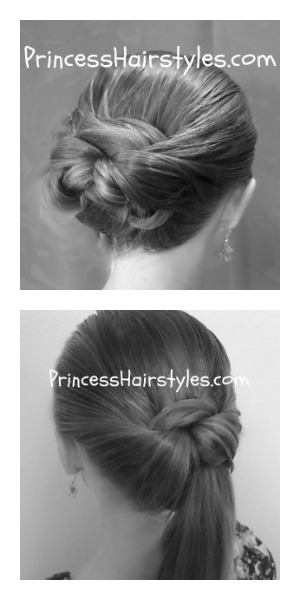 "Tuck And Wrap" Bun and Ponytail Hairstyles. Quick And Easy School Hairstyles Using A Topsy Tail! I know that many of you will be going back to school again in the coming weeks. So, I wanted to do a couple of easy, quick and cute hairstyles for school mornings. This casual bun (and ponytail) are both easy hair styles to create. But, you will need a "topsy tail" and fairly long hair to pull this off. 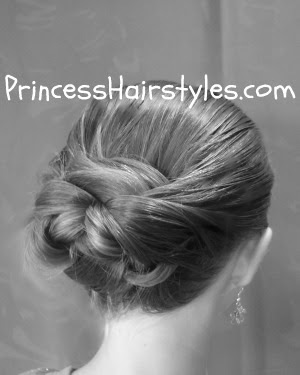 We noticed when this bun was completed that the wrapped pieces of hair almost look like flower petals forming a rose. A flower bun! I have always loved the look of a cute messy bun, but find them quite difficult to make lately with the princess's long hair. This method is definitely much easier than other messy buns we have tried. 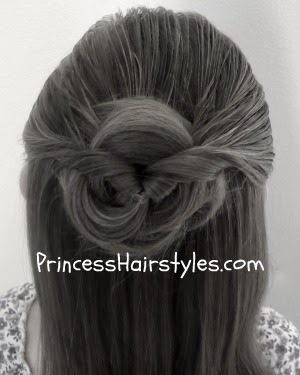 Both of these 5 minute hairstyles are casual enough for everyday wear but could also be worn for special occasions such as a casual wedding (flower girl or bride) or a formal dance like Prom or Homecoming. BTW, If you don't have a topsy tail, I have seen them available in some stores such as Claires, and online at Ebay and Amazon. 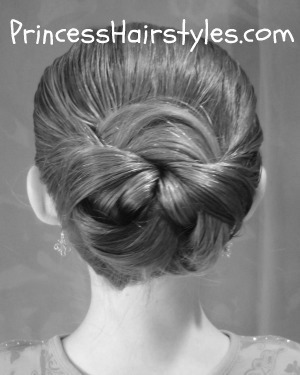 What a pretty and easy up-do! I love both the bun version and the elegant ponytail. You've convinced me: a simple string just won't do anymore, I must have a Topsytail! I tried without a tipsy tail and it didn't work. I'll try to get one. Ps. I'm doing it on myself. I tried this on my 2yr and it looks great! Where can I get a topsytail? Is that something I an get at Wal*Mart or Target? Or do I have to get it at some kind of specialty store? How much do they cost? Oh!!!!!!!!!! Very Nice hair style. For those who don't yet have a topsy tail - I purchased mine on ebay for literally 6 cents (and that came with free shipping)! Had to wait a couple of weeks for it to arrive from Asia, but certainly couldn't beat the price!!! Love this hair-do too - can't wait to try it! Thanks for the beautiful style! I wore it to a barn dance,and it STAYED IN!!! I did this style with out a topsy tail and it worked out but of you have thick hair you need a topsy tail with thin hair it works without. all amazing hair style collection!!!! All collection of hair style is really amazing....very pretty..
Love this hair do!! So beautiful and classy! Thanks for your wonderful ideas on how to do hair! I did this on myself today and loved it! I will have to try it on my daughter next. Thanks! No need to buy Topsy Tail.....I made one out of a wire hanger and some masking tape;) works just as well and cost nothing!!!! Such a darling hair style!! Love it! I can't wait to try it on my princesses! Luv it...i can't wait to try it on my princesses!! So elegant and contemporary! I don't use a topsy tail, I just put two fingers through from the bottom, and pull it. Such awesome hair! I have tried so many of these hair styles on my 6 year old daughter. She has had many comments from kids at school and the Mom's always compliment me. I have tried other sites and their videos are not as great as yours or as easy to follow. This is the ONLY site I use now due to the styles and the videos. Thank you so much!! i love this website its got such pretty and easy things to do to ur hair ive tried everything else and i love this website i stick to it I LOVE IT !!!!!!!!! I'm only 13 and I want to buy a topsy tail and I saw 2 on ebay for only 6 cents and I don't know if my mom will let me get them... i have a question will it seriously only be 6 cents?